Thanks to end-to-end encryption, Facebook will not be able to see your messages, photos or other media you share. The new policy grants WhatsApp the right to share your number with its daddy Facebook. Thankfully, there is a way to opt out of this. But WhatsApp’s opt-out period is only 30 days long, so if you don’t want your phone number shared with Facebook, opt out now before the window closes. Only you and the person you send messages to will ever be able to see that information. But for some reason you might not be wanting to share up your WhatsApp phone number to the Facebook and might also want to keep it private too. If you don’t want that then you need to follow the bellow instructions. At first you need to open up the WhatsApp on your device now follow the next step according to the platform of your device i.e Android, iOS etc. Select Account. On both Android and iOS, this step will be same, you just have to find up the Account option on these different interfaces and then tap on it. Tap the check mark to the right of Share my account info. 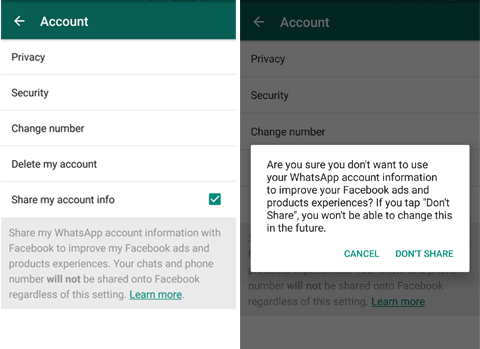 If you want to change the WhatsApp privacy in such a way that it doesn’t share any data of your Account with your Facebook account then you will have to just uncheck the Share my account info box. To disable the feature, tap Don’t Share and that shall be disabled from that very instant. But there is something that you need to remember and that is very important to know once after you will stop this feature then you won’t be able to see that feature in your WhatsApp settings. Hope you like it.